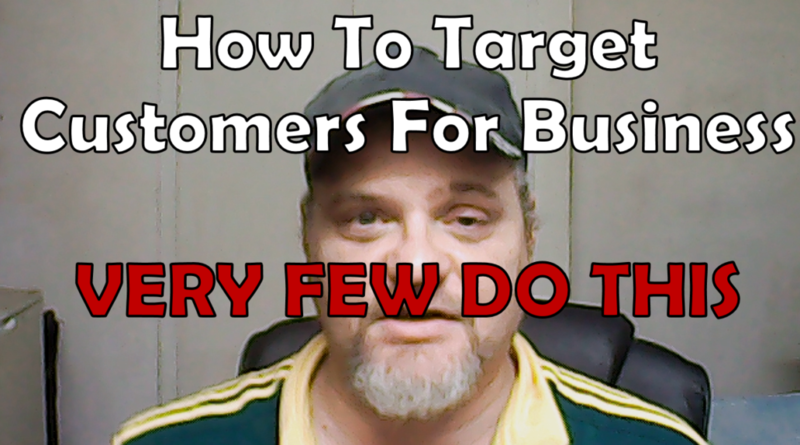 I'm going to be talking about how to target customers for business. But more about Finding your Avatar and what it means. You see, finding your target customers can be done though promoting and putting up some ads but if you just making a broad statement like “Want to lose weight” all you doing is throwing a handful of stones and hoping to hit something. If you have a person in mind then you really are targeting something and you can aim right. When I first wrote my book I was righting to an audience. But when I advertised it I was not aiming for a specific person I was was hoping anyone would buy it. It's no wonder I only managed to sell 2 books in 6 months. Once I knew my avatar I knew who to Target. An Avatar is a very specific person that you have in mind. I'm talking about everything about that person. From Name, Gender, age, hair color and job. There wants and so on. I cover this more in the video so I hope it helps. But really, understanding who you are targeting is so important. Now if you are saying “I already know this and Its seems a bit woo woo, please THINK AGAIN! This is one of the main reasons a lot of people don't get anywhere. Its because there customer is so general and basic it doesn't reach anyone ears. I cover this in detail with my Training but I wanted to give you an idea of what you should be doing so that's why I made this video. I would say that Making an Avatar is one of the least done exercises done by Online Marketers. If you are serious about reaching your target customers for business TAKE THIS ADVICE. I regret every day I didn't.